Hello everyone.. It's time for the May Release from Newton's Nook Designs and you are gong to love this month!! There's a set perfect for Summer, Dad and more. Today we are sharing the new Winston set Winston's Tee Time. I created a fun background for Winston using some Distress Inks on a piece of Watercolor paper. I used the small golf ball image in the set to create an embossed resist image in the background as well. I trimmed a 1/4" off one side of the panel and stamped the sentiment along the left side. I stamped the images on some Copic friendly paper and colored them in with Copics. Then I used the coordinating die to cut the out and adhered them to the panel with some foam tape. I created a top folding A2 side Black card base and added a strip of Black and white striped Washi tape along the edge. Then I added some foam to the image panel and adhered it that to card base. This set if perfect for Dad!! 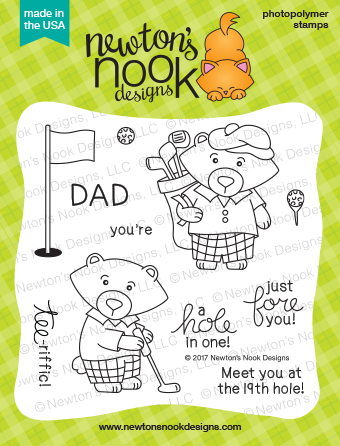 Labels: Blog Hop, May Release, Newton's Nook Designs, Winston's Tee Time. Very pretty background, great design! Beautiful card! Fantastic​ job coloring and I love the watercolor background! What a gorgeous distress background! Love the amazing design and your adorable coloring! Awww!!! How cute!!! Beautiful colouring!!! Wow, I love your card, with the adorable Newton!! Beautiful background! So cute. I like the watercolor and golf ball background. its a very beautiful card! What a fun background for this golfing Winston! Lovely card, that background is super fun! These bears are so adorable! I like the sentiments in this set also. Great card design. Beautiful background, I love how you colored his clothes!!! Oh wow! Your background is so awesome! I LOVE the heat embossed golf balls, and your coloring is so beautiful!!! Winston is adorable and the background you created amazing. 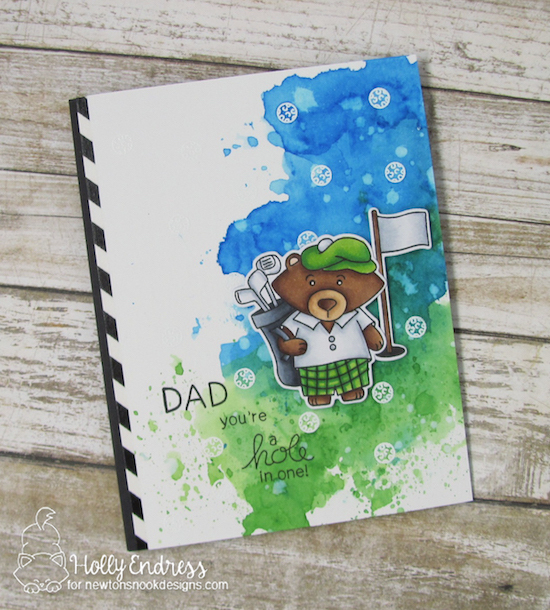 Fabulous golf card, Holly! The background colors are gorgeous and I love the emboss resisted tiny golf balls. Really fun! 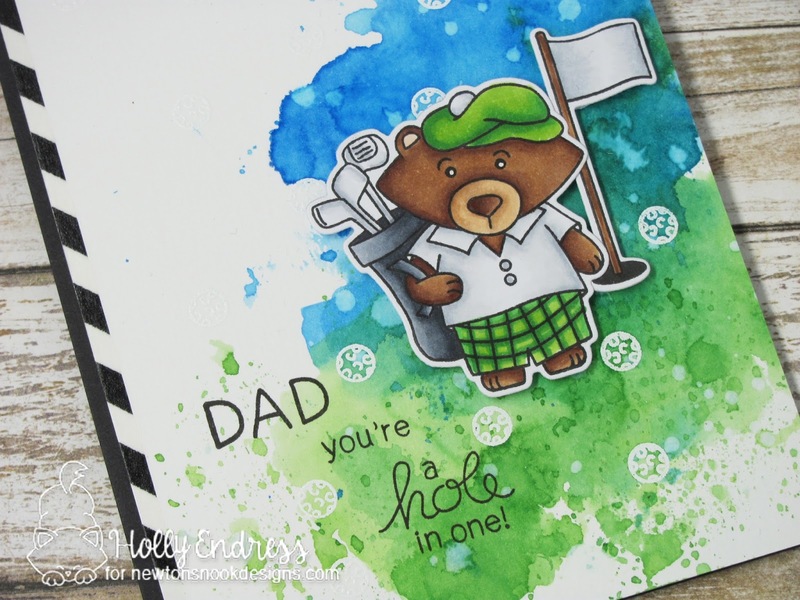 Besides being a stamp enthusiast I'm a golf addict and would love to win that adorable set! I have to smile when I see all those golf balls everywhere as it reminds me of me trying to golf. lol! cute card...LOVE the background. Gorgeous background and I LOVE the coolring on Winston! What an adorable card! Great use of the Distress Inks for your background! This is so fun and totally adorable!